With over 30 years of executive protection experience, DMAC Security has established an excellent reputation in the private security, executive protection industry. No other company can offer the level of professionalism, experience and exclusive services you’ll find with DMAC Security. We help our clients make smart executive protection decisions when it comes to ensuring their personal safety and the security of their offices. We provide services coupled with an alarm response that keeps thieves at bay and safeguards homes and businesses. DMAC Security is a quality conscious security company that provides exceptional security services to its clients. We provide executive protection to businesses for the planning and implementing of safeguards to protect employees and property. We are uniquely qualified to provide you with executive protection customized to meet your specific needs. Our executive protection team consists of current and former police officers, both men and women, offering years of executive protection, in diverse physical and personal security, specializing in High Net-Worth Individuals. Security woes are increasingly becoming a source of concern due to the higher incidences of a breach. In such a scenario it becomes mandatory to have executive protection security coverage for yourself and your premises. Whether you are a celebrity being stalked by an obsessed fan or a corporate big shot concerned about personal safety, we offer executive protection services for any situation. Executive Protection Services to keep you safe. Being a celebrity means constantly being in the public eye, as well as being exposed to all kinds of crowds and situations. Celebrities require personal security to keep them safe from stalkers and protect themselves from any harm when they go out for social commitments. Government officials obviously handle a lot of government secrets in the course of their work, making them vulnerable to harm. Senior management works on company policies and its administration, making its members an easy target for competitors and adversaries. A large bank balance attracts attention of the wrong kind, leading to risks such as abduction and physical harm. Our executive protection can keep you and your money safe. Businessmen own and run one or many businesses of their own. They need executive protection from anti-social elements looking to siphon off their business secrets or finances. These representatives of the common people are often targeted by members of the opposition. Our executive protection services can help keep politicians safe. Leaders and social activists who visit various states and countries to address particular issues or spread a certain message are often subject to harm and manhandling. Assessing risk for executives is an ongoing need. General risk can be assessed based on risk from threats to the company, level of personal profile the executive maintains, residency and travel. However, the risk level changes as issues develop and the executive’s travel schedule should always be assessed on need. We will assess the security situation before you arrive. We will survey all of the relevant locations that your employees or executives may be visiting to assess the security situation, including the hotel, meeting locations, restaurants and tourist attractions. Executive Protection Thailand will make contact with the drivers, tour guides, local law enforcement and any additional personnel that your employee might come into contact with. Executive Protection Thailand Agents are adaptable to any social, formal or personal situation. We pride ourselves on maintaining security and privacy for our clients in a “low key,” but professional manner. Our goal is to provide invisible layers of protection around you while maintaining the highest level of security possible. Executive Protection Services are often utilized for special events that will host a large number of executives or dignitaries. Proactive high profile and low profile coverage can be developed based on the event’s specific needs. Our top priority is to provide our clients a safer working environment without compromising their privacy. Our protective detail design, with emphasis on advance site surveys and proactive approach, allows us to achieve this goal. You can concentrate on your business affairs without concerns regarding safety, medical needs or transportation coordination. Dismissals have become a serious threat to many companies. We can conduct background checks to determine whether the employee has a history of violence and then assist in a standby capacity during the termination to protect management and human resources. It is sometimes necessary to maintain a security presence for a short period after the termination as precautionary security in the event the employee returns. Executive Protection individually selects trained agents to coordinate and manage the specialized security needs of celebrities, dignitaries, executives and VIPs. Our Executive Protection drivers have advanced driving skills and all vehicles carry first aid and safety equipment. A full airport service is also provided. Executive Protection (celebrities, executives, diplomats and etc.) is fast becoming an important element of effective security plans. VIP’s are increasingly targeted by irate former employees, eco-terrorists, criminals, foreign terrorists, foreign corporations and even via internal business espionage activities. The resulting security breaches threaten entire businesses, families, employees and “fans” (for celebrities and other high-profile individuals). 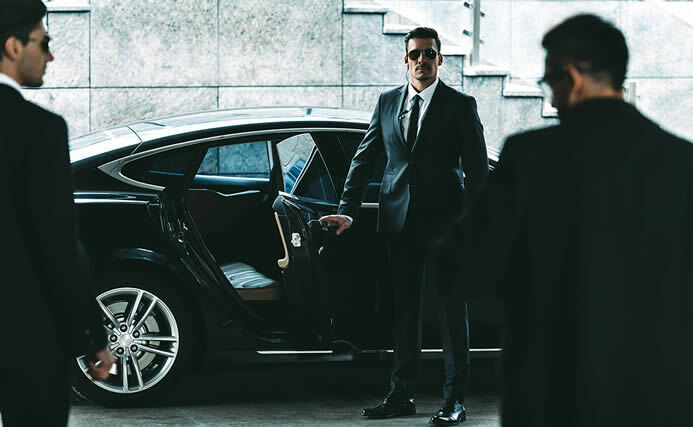 Our Executive Protection Professionals are experts at providing effective personal protective details and counterespionage services, which not only provide physical security but also ensure the privacy and personal security of our clients. Our priority is on deliberate avoidance of confrontation with an emphasis on keeping our ” Principals” out of harm’s way. This is accomplished with low profile personnel, thus allowing those who have the protection to continue with ordinary daily activity without interruption or inconvenience. Whether you are a visiting executive, foreign dignitary, diplomat or a resident VIP of Washington, we stand ready to provide the professional security services you need whenever and wherever you need them. We can even provide traveling security details to provide continuous coverage of your security needs. We will protect you, your family and your property 24 hours a day, 7 days a week. And, we can provide executive protection security services as necessary or when requested. If you or your company has experienced threats or has reason to believe they are being targeted by anyone from anywhere, call us immediately. Protection can be as close as a phone call away.